January 4th, yesterday, was my birthday! Thank you all for best wishes! And thank you Mom and Dad for birthing and loving me even to this very day! For introducing me to unconditional love, the power of connectedness, creativity and caring and the eternal oneness of us all that’s so incredibly designed in the universe! Thank you for Figi Stories on my Daddy’s knee, the opportunity to grow up with incredible siblings and develop a sense of community with those around me, even complete strangers. Thank you for so much more than I could ever even know or think of to write down! …this brings me to…THE BIRTHDAY PILLOW. My friend Sarah is the one who calls it to my attention over and over. Whenever Sarah is over to our house, she notices that the Birthday Pillow is in a different place! “Ann, you should write a book about THE BIRTHDAY PILLOW! It seems to have a life of its own. Though, I think it is really Sarah’s story to write, since she remembers all the places it has gone better than I, I’ll at least start the process of writing... something today. 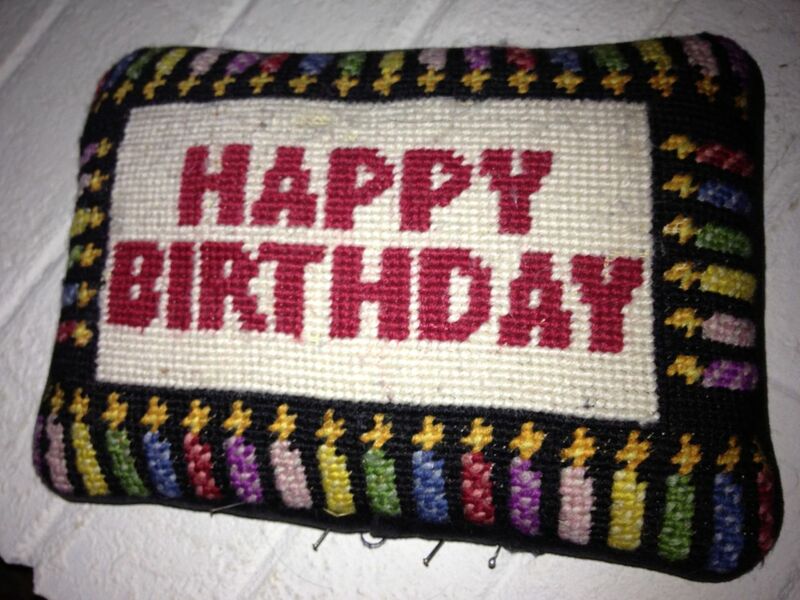 Small, rectangular, and carefully stitched with the letters Happy Birthday, this little pillow first sat on our oldest son’s bed on one of his young birthdays…not sure what year…perhaps 4 or 5? one of the years when he was deciphering the code of letters that create written words that express meaning. And from there the pillow had conscious placement from time to time in places or rooms that celebrated remembrances of those amazing first beginnings of each of our children…moments when new spaces in our hearts opened to hold them forever on. New persons that became part of our heartbeats…that forever carved spaces in our hearts that could hold them beyond the end of time! A small pillow could never express all those moments and the love they grew and continue to grow in us! Over the years…the pillow moved…from room to room, from house to house, from floor to high shelves, to bags of extra pillows looking for a place to be, to special moments from time to time when its words were timely for a day and a specific person. The letters and words there even on ‘off days’…a reminder that special people were born into our lives and that someone is being born somewhere in the world every second. It’s been through the washer and dryer…for dust seems to be born every split second, faster than eyes could ever blink! It’s had special moments in playful pillow fights, been a perfect doll pillow on a doll bed, and even been used in games of kickpillow, a game I remember playing with my siblings as a child on rainy days…similar to kickball, but played in a large room with a small pillow…usually best if it’s round. I remember trying it with our kids, but they seemed to go for real sports instead. Though the letters and borders of little birthday candles must have been carefully designed and stitched when the pillow itself was birthed, that was the last loving care it received, since our lives never carved time to tend to it. 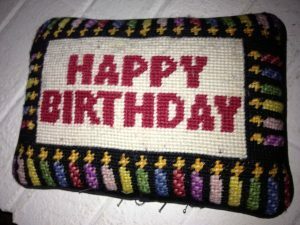 Aptly so, the BIRTHDAY PILLOW over the years hasn’t been able to contain all the birthdays that have been stuffed into its 30 some years of life…so one of its edges has frayed and the stitches that have held it together over the years have come apart. Perhaps 10 or so years ago, I briefly tended the sweet little pillow that has so loyally stayed with us, even when we shove it aside for so many unbirthday days in our family, by at least pinning the opening shut so its stuffing wouldn’t come out . That’s as far as my tenderness went, and to this very day, our sweet little birthday pillow is held together by straight pins. Today, little birthday pillow, January 5th, I declare as YOUR birthday! and I shall gather a needle and thread and stitch your 10 year old boo boo so that your stuffing stays in and the pins no longer pierce your precious pillow self! I know not your true story nor your true birth day and I may never know. But I love you still and forever for celebrating with us the births in our lives, real and metaphorical, chronological and spiritually eternal. Thank you for always being around to remind us of all new beginnings, in new and unlikely places and moments in our lives. As for writing a book about you. I think I’ll commit to listening more to you, to Sarah, to LIFE…and see what develops! So take heart, sweet pillow…your story will grow also over time. Love and thanks from Mossy Me!